What!? I can help others in need just by packing a bag and going on holiday? ‘Packing for a Purpose’ is something that all travellers should consider before they venture off on a holiday to Africa. The ‘Pack for a Purpose‘ movement provides a network for travellers around the world to contribute something positive and uplifting to the area they are visiting—just by carrying some extra stuff in their luggage. And that’s exactly what Leah Husemann, a guest t0 Victoria Falls, did when she visited recently. 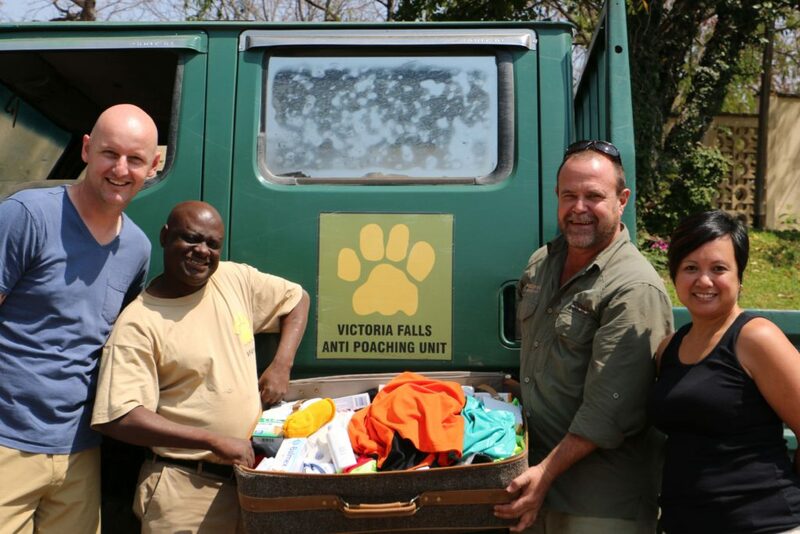 She brought much-needed medical supplies for the local Victoria Falls Anti-Poaching Unit, who do great work in stemming the tide of poaching in Victoria Falls. VFAPU is often in need of additional medical supplies for their teams in the field, and so when Leah volunteered to bring the items with them on their holiday, we suggested the supplies go straight to the VFAPU—a helpful injection of medical equipment that will go very far in helping the teams stay safe in the wild. This is what Pack for a Purpose is all about. These thoughtful guests have now made a big impact on the fight against poaching in Victoria Falls, and all they had to do was bring an extra suitcase along. The medical supplies included six bottles of iodine solution, large bandages, alcohol prep, large waterproof tape, and toothpastes. In addition to the medical supplies, Leah brought soccer jerseys for the National Park staff, who work closely with VFAPU in the fight against poaching. The jerseys were for the staffs’ kids, who all play in a team together. The package included over 50 shirts of various colors and sizes, and was warmly received by the kids who will now have proper uniforms. We encourage all our guests to get involved in the Pack for a Purpose cause, and we’ll make sure your contributions go to the most worthy organizations in Victoria Falls.